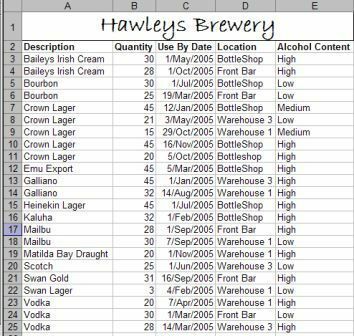 In Excel we can use the Subtotals feature found under Data on the Worksheet Menu Bar to Subtotal a table of data. When doing so it is imperative that the table of data is sorted by the column you wish to Subtotal ("at each change in"). The Subtotal can be in the form of COUNT, COUNT NUMS SUM, AVERAGE, MIN, MAX, PRODUCT, STDDEV, STDDEVP, VAR or VARP. Let's use the table below to apply subtotals so we can get a count by "Description". As you can see, the table has been sorted by the "Description" column. This is required if we wish to use the "Description" column to get a Subtotal count. It is important to note that Count in this case is not a count of only numbers like the COUNT Worksheet Function. For that, we would use Count Nums. The picture below now shows us what it looks like after applying Subtotals and also the settings we have used. We would copy this down to the last row that has a date in "Use By Date". If F2 we could use the heading "Month". This would then give us a column of numbers that only change when the month in the referenced "Use By Date" column changes. We would then simply apply Subtotals as shown above using the "Months" column. Note that in this case, as the table has been sorted by "Use By Date" we do not need to re-sort the table by "Month". We could, but the result would be exactly the same.